To start the salsa, first peel and wash the tomatillos. Then place into a pot, along with the Serrano peppers, cover with cold water, and bring to a simmer. In the meantime, peel and roughly chop the garlic. Then finely dice the onion and set aside, while you chop the cilantro. Once the tomatillos. turn a golden yellow color and start to split, remove them from the water. Next, place the garlic into the blender. Cut off any stems from the serrano peppers and add peppers to the blender. Once the tomatillos are cool enough to handle, remove any large cores. Do not remove these prior to cooking or they will become water-logged. Add the tomatillos and salt to the blender and pulse just a few times. If you still see big chunks of chilies, pulse a couple more times. Pour into a bowl and add the onion and cilantro. Mix and taste for seasoning. Depending on the tartness of the tomatillos, you may want to add a squeeze of lime juice. At this point, this dish is called Salsa Verde. It can be stored in the refrigerator for at least a week and can even be frozen. 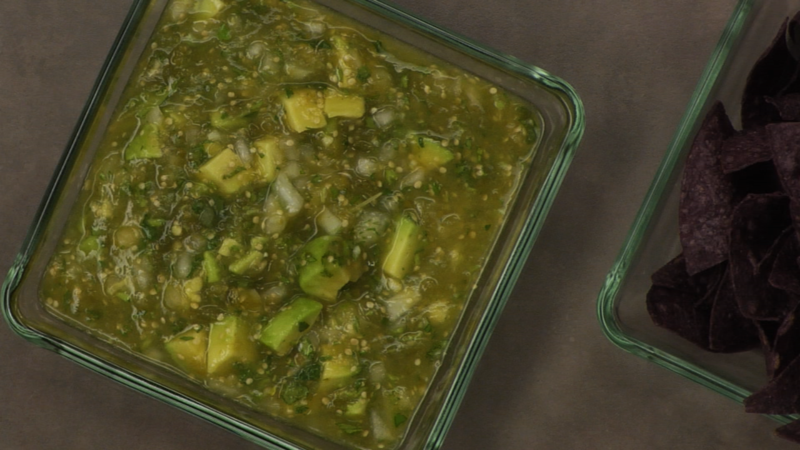 To make this into Salsa Verde de Lupita, simply dice the avocado and gently stir in. Note: If you would like a spicier salsa, just boil another serrano pepper and blend it with a little bit of water. Mix it into the salsa to taste. 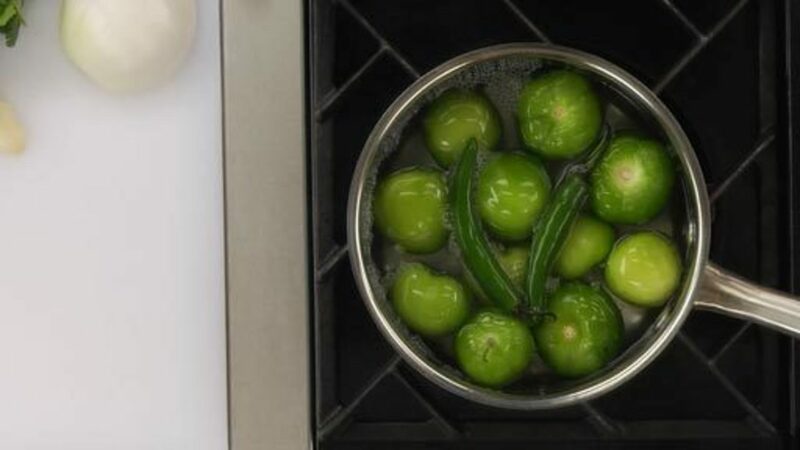 Alternatively, you can char the tomatillos, serrano peppers and onions, rather than boiling them, for a more smoky end flavor. If you would like a spicier salsa, just boil another serrano pepper and blend it with a little bit of water. Mix it into the salsa to taste. Esta Receta esta cencilla pero muy rica. A toda madre Dona Lupita. Made this for a party we had this past weekend and it was hit with everybody!! This recipe looks amazing, and I can't wait to try it. However, tomatillos aren't readily available at where I live. Can it be subtituted with regular tomatoes? I've been using this salsa as a dip for chips and it also went great over some halibut. (great in a fish taco too). Very easy to make! I think to take some of the bite of the onion out, I may let the onions sweat in a pan a little bit before I add them to the salsa. There were also a lot of bugs in the Tomatillos I grabbed. When you do buy them, make sure you grab more than you need. This was my first time ever to use tomatillos. I was a bit unsure cooking them as by the time they changed colour they still had not started to split the skin so I cooked them longer. When I cut the cores out , a lot of fluid escaped that didn't seem to happen in the video so I may have overcooked them. Also, I get confused by all those different peppers out there and ended up using jalepeno instead of serrano. The end result though was a delicious salsa that was plenty spicy enough for us. Another great Rouxbe recipe! Happy you liked the salsa Liz. As for the tomatillos, don't worry if the skin did not split the same, nor should you worry if there was a bit more liquid after cooking. This is likely due to how ripe and or not-so-ripe they all were. In the end it really doesn't matter so much...again glad you like the salsa, now you should try the chicken enchiladas, easy and yummy! I made this the other day but instead of boiling the tomatillos I roasted them, along with the onions and jalapenos, under the broiler. I then covered them to steam off the skins and then I peeled them. Much like the Salsa de Molcajete recipe. Charring the ingredients first really gives this salsa a nice added layer of flavor. Also, you can see from this photo that it also gives the salsa good color. I would have to say that I highly recommend trying it! Agree with Jose P. I really like this salsa with pork chicharrones and fried beans! Viva la salsa! Dawn: Approximately how long did you roast the tomatillos, onions and jalapenos? Also, did you juse a pestal and mortar as used in the Salsa de Molcajeta recipe or did you use a blender as used in the regular Salsa Verde recipe to generate the textured Salsa? I roasted them until they were done (fairly charred). I think it was about 30 or 40 minutes...but really just keep an eye on them and when they are nicely charred on all sides they are done (don't get too carried away with the charring business, they don't have to be black all over or anything). After that I just used the blender. Hope this helps - cheers! Dawn: Thank you so much. By the way, I just read the interview of you on Reluctant Gormet -- Very interesting and enlightening. It may already be known by everybody else; but I didn't "know" you were the hands and voice on the fantastic Rouxbe videos. However I "knew" it was you just by looking at your picture and reading some of your responses to questions. Now, I "know" for sure that what I "knew" was true! Great job! Ah shucks thanks John, indeed it is me. Thanks for your kind words, much appreciated. Cheers! We just our second annual salsa contest at my workplace, and I was goaded into entering. The hosts were worried that no one had told them in advance they were entering, so they asked me to submit a salsa. I thought of this recipe, which I had just seen last week. I printed off the text version of the recipe and dashed over to the supermarket for ingredients. Because of a "No Guacamole' rule, I left out the avocado--I didn't want to get nailed for a technicality. I pulled this together in our workplace kitchen in about the thirty minutes and garnished with some of the left over lime. It turned out I was competing against five other entries after all, and it was a tight race. The three judges even went to an elimination round. And I won with your recipe! Congratulations! And thanks for being here. Nice work Jim - congrats! sorry to ask a stupid question, is tomatillo an unripe tomatoes? No a tomatillo is not an unripe tomatoe but it does come from the tomato family. Here is a drill-down about tomatillos that goes into a bit more detail. Cheers! Can we use canned tomatilloes here ? I'm having a problem with finding ripe fresh tomatilloes. You can try using canned but I don't think it will be the same. I have used canned tomatillos in the past for other things but I did find them to have that same fresh flavor. Perhaps there are some brands that are better than others but for this salsa I like to use fresh tomatillos. Cheers! Just made it today with the fish taco using canned tomatillos and all I can say is WoW. This salsa is amazing I actually regret that I didn't try it earlier, I really love this salsa I swear to god I have no problem drinking this stuff. Since the canned tomatillos is already cooked I roasted the chillies and used jalapeno and Serrano. 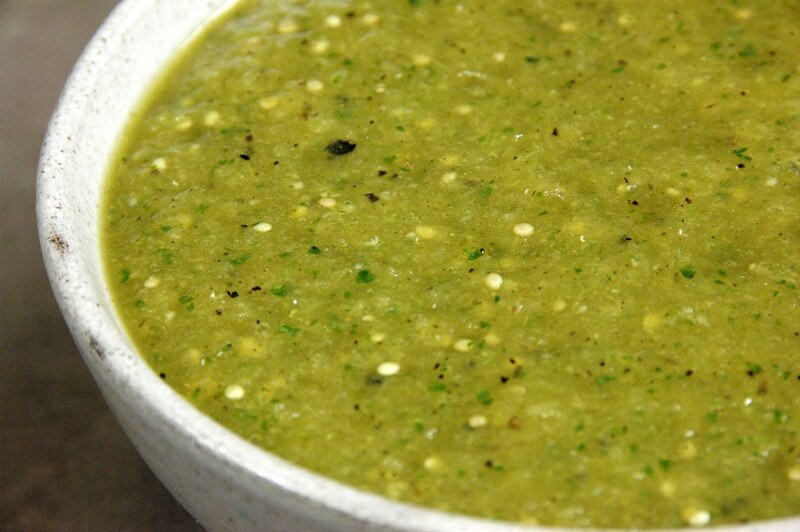 You will no longer be making this particular salsa verde but you are free to experiment with other ingredients. You can try this same method or you may want to peel the tomatoes. Cheers! I need to make at least a double batch, maybe even quadruple for a large group - I want to make the Enchiladas Verdes on this site. How much Salsa Verde does one recipe make, how much do you suggest for a quadruple batch of enchiladas? Thanks, love your site! As the text recipe states, it makes about 3 cups of salsa. If you want to double, triple or quadruple, simply multiply the number of ingredients by however much you want to make. It is hard to say exactly how much you will need for a quadruple batch of enchiladas, as I am not sure how big your enchiladas will be, how much filling you will add etc. However, this salsa keeps quite well, so I would suggest you go for 4x's the recipe just to be safe. Hope this helps. Cheers! Thanks, yes after I commented I realized it did say 3 cups, still this information is helpful...here I go, got my tomatillos cookin'! Good luck Cindy. I am sure everyone will be thrilled with the enchiladas! Would this recipe be a good candidate for canning? I like to make jars of things and give them as holiday presents. Thanks. A plain salsa verde can be easily canned but this version includes avocado - which will turn brown and otherwise not be good when canned. Good luck! I made this salsa along with the braised carnitas tacos: http://rouxbe.com/recipes/curated/149. I was a but nervous about the heat that both serranos would bring to the dish, so I de-seeded one of the peppers prior to blending it into the salsa. When I first tasted the finished product, I thought it was a little too hot to serve for a crowd with chips. However, the salsa's heat is incredible with the carnitas tacos and a perfect winner. If you aren't accustomed to heat, watch the seeds in your peppers. My salsa was as hot as any "hot" salsa at a restaurant and that was with just one of the pepper's seeds. This is a true winner, and I enjoyed cooking with new ingredients like tomatillos. This will definitely be a staple moving forward. Once in La Paz Baja, best breakfast (top ten) and have tried to recreate. It was served in an earthenwear bowl, bean on bottom, tortilla (still had a bit of crunch) then salsa verde with a poached (?) egg. Some flecks of queso. It was and is a recipe I will chase down. This salsa verde I roasted all and then use my old but love it still Braun to puree. It tastes so close. Will try to recreate tomorrow with eggs. Did not include avocado, yet. Will wait until cools and then I get closer to that magic. Got me closer. Thank you! !! Is there enough acid in tomatillos to keep avocados from oxidizing? If I'm making this salsa ahead-of-time, in other words, should I wait to add my avocados?